The focus of these seminars are the truths of a pure Gospel . Jesus told us that God seeks those who will worship in "Spirit and in truth". The time has come for this truth to be clarified to the world and especially for the body of Christ. The eventuality of this Gospel message is at the heart of its power to transform. 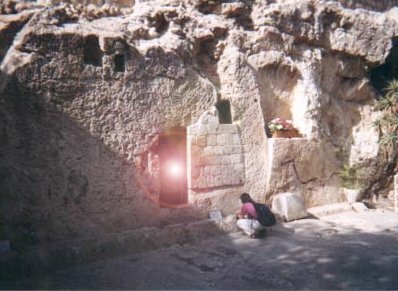 It is the hope of the resurrection. With out this promise the Gospel is meaningless. It is sad that in these last days the hope of the resurrection has become obscured and its clarity dulled. The pattern of God in prophecy has at its hub this truth of the resurrection. In the seminar the scriptures are revealed in the context of the Spirit of God, by the sacrifice of Christ. The pattern that God both creates by, and how revelation to comes to us through Jesus, is revealed through these studies of a world that is passing away and an eternity that is dawning. This brings the question that the Lord is putting forth in this generation. "Are you attached to what passes away and is destroyed, or are you holding on to the hope of the eternal?" Does your church want to host the seminar? Simply send an email to rsneaville@propheticjournal.net and arrange for it and further information. A complete curriculum will be sent to you mapping out what will be covered in this three night seminar. "If My Gospel Is Hidden"
Order your copy to day! R.S. Neaville is both an author and a Bible teacher. He teaches from his pulpit daily on the internet in a number of ineractive voice programs such as www.paltalk.com and downloadable studies and audio sermons from his website at www.propheticjournal.net. The Christianity section of www.paltalk.com is one of his main venues for preaching the Gospel on a daily basis. He holds intimate discussions and studies with groups of Christians on a variety of topics. He is the former host of the "Know the Truth" Radio Broadcast on KMNL fm in Amarillo Texas and Is currently a featured speaker on "KNOW" radio across the internet world wide. He serves as an evangelist and speaker in churches throughout north Texas and Oklahoma. He contributes articles and studies on a regular basis to various internet Christian resources and magazines. R.S. Neaville is one of the pioneers of this new opportunity to preach the Gospel via the world wide web attracting readers and listeners from around the globe. What makes him unique is his use of similitudes and metaphor in teaching that makes even the most complex of Bible principles unfold in a simple clarity. Neaville focuses on apologetics and a unity of the faith as well as the importance of personal prayer and scriptural study.